Gary Fitzgerald of Crescent College tackled by John Fox of Castletroy. REIGNING CHAMPIONS CRESCENT College are back in the Seat Munster Schools Cup final after a 15-point victory in this afternoon’s semi-final in Rosbrien. Victory sets them up for the decider against fellow Limerick school Ardscoil Rís on St Patrick’s Day. Tries in either half from Sean Fitzgerald and JJ O’Neill helped Crescent College claim success while the boot of Fionn McGibney contributed 13 points for the winners. Crescent College lead 13-3 at the interval while Ronan Murphy did grab a consolation second-half try for Castletroy College, who last won the title in 2008. Crescent College will now hope to complete back-to-back titles for the first time since they did so in 1989 and 1990. Opponents Ardscoil Rís will be seeking their first ever crown in what will be only the school’s second ever final appearance. 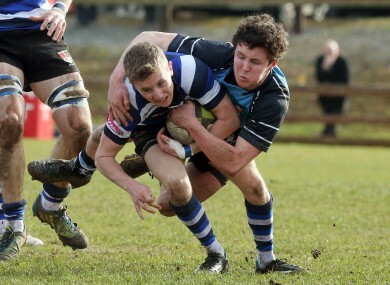 Email “Reigning champions Crescent College set up Munster Schools Cup final with Ardscoil Rís”. Feedback on “Reigning champions Crescent College set up Munster Schools Cup final with Ardscoil Rís”.